3rd Rock is a core climbing brand making apparel for climbers. 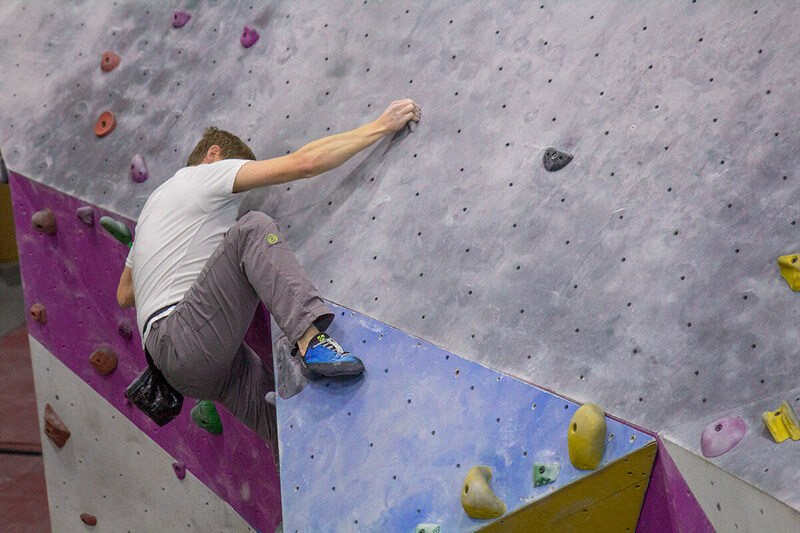 They’re not a lifestyle brand looking to sell skinny jeans to urban hipsters who might, someday, check out a climbing gym. As such, the Ramblas pants perform incredibly well while climbing. The fabric has a comfy, cottony feel and is impressively stretchy, but it looks stiffer than it is because it wrinkles quite easily. It also breathes quite well (albeit not quite as well as technical pants like the Outdoor Research Ferrosi) which makes a ideal for most situations — providing warmth when it’s colder and breathability when it’s warmer. In the summer, I’d be wearing shorts instead. Performance wise, the Ramblas completely hold their own as a climbing pant. There are a couple of fit aspects of the Ramblas that leave me wanting. Although they’re stretchy enough to facilitate even the most demanding leg positions, personally I’d like a little slimmer fit in the lower leg (something I wish of most pants I climb in). The extra fabric around the calf and ankle makes the pant comfortable and airy but, on rare occasions, obstructs visibility or gets in the way during delicate and tricky foot matches. Some folks might find them baggy; they’re a relaxed fit, and the material stretches so much, they might not need to be that relaxed. If you prefer skinny jeans or slimmer pants, I wouldn’t recommend the Ramblas. They also seem longer than expected. I have yet to actually notice this as a distraction while climbing but it’s not my ideal. Traditionally I’m a dead on 32″ inseam and these Regular Length (32″ inseam) are an 1″ too long for my liking. The inseam is literally 32″ but they must ride differently than my traditional jeans. I’d still buy the regular length in the future (versus the short), because I’d prefer to roll the pants versus risking them being too short. So, with the extra material in the lower leg, I’ll be rolling them up to avoid stepping on the back of the pants. Note: The previous Ramblas (green and red version) are only available in the regular length, this newer gray version has options for a short length or regular length inseam. Exceptional range of motion. Granted I’m not the most flexible branch on the tree, but I can’t imagine needing any more stretch out of a pant. There’s a very small waist adjustment but it’s only enough to make a difference between feeling loose and feeling not as loose. For me, the adjuster isn’t quite enough and I need a belt. The size M (81 – 83.5 cm / 32″), although squarely in my preferred size, feels a little big for my 32″/33″ waist. I was worried that the little waist adjuster plastic buckle would dig in if I was wearing a belt over the top of it, but I don’t notice it at all. Note: The previous Ramblas version comes in green and red and the position of this waist adjustment is slightly different (pics on 3rd Rock’s site). I tested a pair of the newer gray Ramblas version. The cut of the main pockets are slanted so much that the bottom of the pocket is low, which makes getting hands and items in and out of them super easy, but when sitting down stuff has a tendency to fall out. I’ve had my phone fall out of the pockets while driving on multiple occasions. There is a smallish “phone” pocket on the mid thigh which I have to admit I’ve never actually used so I can’t comment on its utility. Maybe using this “phone” pocket to carry my phone would keep it from falling out – a novel thought. The fabric does seem to attract chalk. It’s not much of an issue, but I’ve noticed that I seem to be covered in chalk dust after climbing in these pants, and it’s not as easy as other materials to dust them off at the end of a session. Please note that I have been described as a chalk whore, and am usually covered in chalk. The difference is some of my other pants hide the chalk better, or clean off easier. Easy: a zipper fly with one button on top. Belt loops and the small waist adjuster mentioned above. The pant also has belt loops if needed. Originally I had a concern about the color. On 3rd Rock’s website, the “Yosemite” color looked purplish-gray but in reality it’s a solid mid-tone, neutral gray. I have a tendency to avoid color in my clothing, and these fit the bill. The “Yosemite” doesn’t attract attention, which I’m thankful for. Although I’d say they’re a cross-over pant capable of going from crag to bar, they only fit the bill if you’re going for a “climber-style” look. They also lose their crisp/new look after a few wash/dry cycles as the fabric and stitching don’t shrink totally evenly (a downfall of most lighter weight materials that don’t get pampered). Most people wouldn’t call out this type of casual look, but it’s something I am very conscious of. I am stoked that 3rd Rock sent us these pants for testing (with intent of a review) as these are the most climber-style pair of pants I’ve ever tried. So far they’ve held up great and the stretch is wonderful. Most importantly, they’re enjoyable to climb in, even though the fit is slightly larger than I prefer. Since I’m a guy that likes to blend in with the crowd, I don’t wear them around town as often as my beloved gray jeans. Overall they’re a great balance of climbing performance and do perhaps the best job of looking like a climber, wherever you wear them. As usual, the thoughts and opinions on this blog have not been altered or tailored from our true experience, despite the “free” pair of pants. In this case, none of the links above are even affiliate links.